What can the very long term tell us about the trend of the US equity market? The chart below plots the month-end values of the DJIA (Dow Jones Industrial Average) from 1900 to the present day. 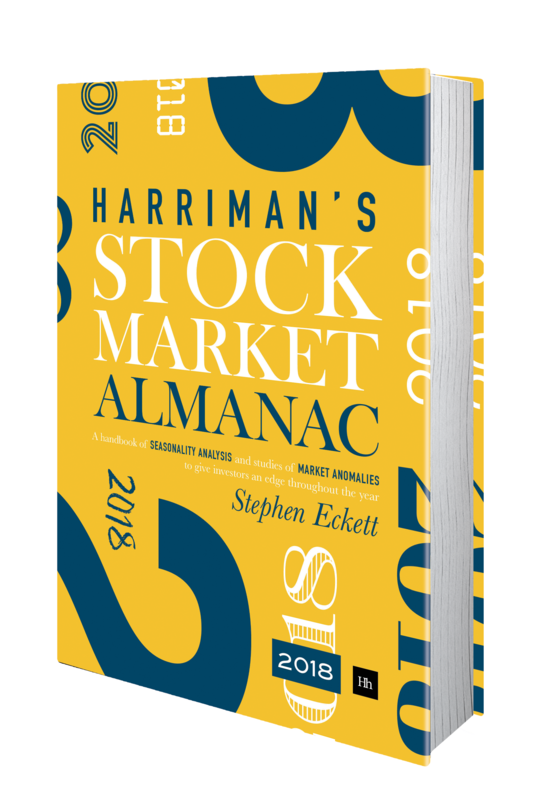 In January 1900 the DJIA had a value of 66 points, and in December 2017 (the time of writing) a value of 24,651. 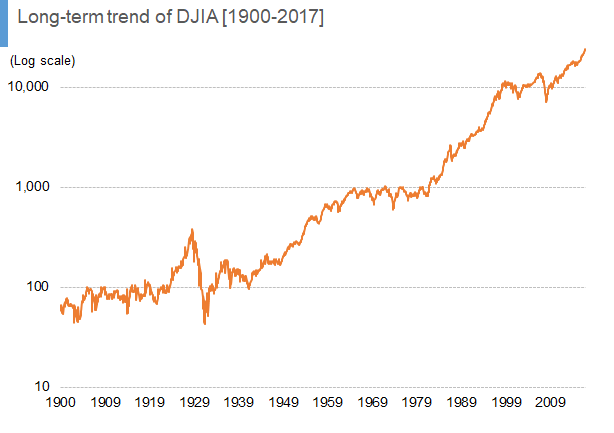 The above chart may be useful as a visual record of actual values of the DJIA, but it is not very helpful in discerning any underlying trend of the index. 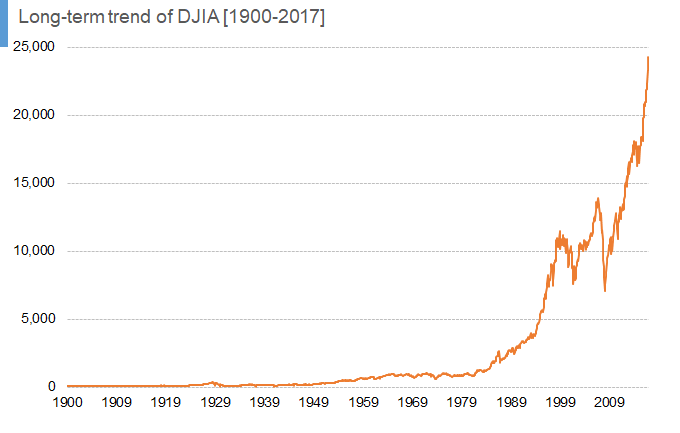 Because the values of the DJIA vary so greatly over the period from 1900, it is more useful to plot them on a semi-log chart, where the Y-axis has a logarithmic scale. This is done in the following chart. This starts to look more useful. To this chart we can now add a trendline (as has been done in the chart below). Regression analysis was used to fit a straight line of best fit to the values of the DJIA. Obviously, the trendline does not perfectly match the DJIA values, but the fit is not bad. R-squared (R2) is a statistical measure of how close the data are to the fitted regression line. In this case the R2 value is 0.93. which is surprisingly high given the supposed nature of random-walk equity prices. We can use the equation of the fitted line to calculate trendline values of the DJIA at any time, including the future. The following table gives the calculated trend values for the current day and a few arbitrary dates in the future. The calculated trend value of the DJIA for today (15 December 2017) is 11,941. The current actual level of the DJIA is 24,651, which means the DJIA is currently trading at a 106% premium to its trend value. Or, expressing this another way, the DJIA has to fall 52% to equal it’s long-term trend value. As already mentioned, the table also calculates future trend values for the DJIA. For example, the DJIA trend value in December 2020 will be 13,928. And by December 2030 the DJIA trend value (23,142) will still be just below the current actual level of the DJIA index. How much faith can we have in these calculated trendline values? Well, the above trendline was fitted to DJIA data for the period from 1900 to today. Let’s see how the calculations change if we fit a trendline to DJIA data from 1919, just after the First World War. So, the following chart is similar to the previous chart, except this time the time range is shorter at 1919-2017. By shortening the time range, the line of best fit now has an R2 of 0.94, a slight improvement on that for the previous chart (0.93). This means that we can have slightly more confidence that the DJIA actual values will be close the calculated trend values. Visually, we can see that the DJIA has been closer to this trendline in the last few years since the financial crisis in 2008, than the trendline calculated for the period from 1900..
As before, the following table shows the trend values calculated using the equation of the new line of best fit on the DJIA data from 1919. This time the calculated trend value of the DJIA for today (15 December 2017) is 15,129. With the current actual level of the DJIA at 24,651, this means the DJIA is currently trading at a 63% premium to its trend value. Or, alternatively, the DJIA has to fall 39% to equal it’s long-term trend value. 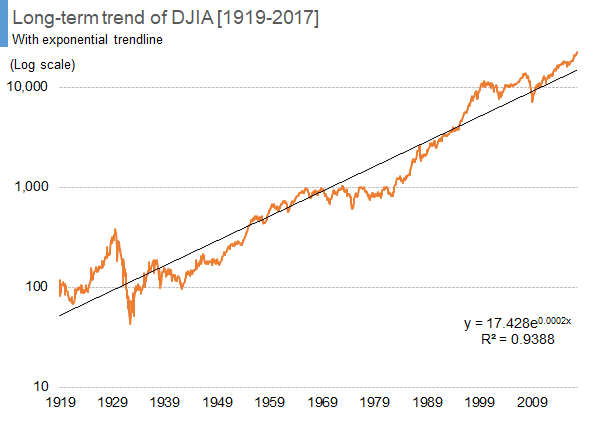 So, first, it would seem that the trendline calculated on data from 1919 gives a closer approximation for today’s actual value of the DJIA than that calculated from 1900. And, second, it seems that the trendline equations are quite sensitive to the exact time period analysed. In which case, let’s look at another example, this time DJIA data starting from 1946, just after the Second World War. The following chart is as before, but this time the time range analysed is shorter: 1946-2017. The R2 (at 0.95) has again marginally increased for this line of best fit on this shorter period. Which suggests that the calculated trendline better fits the actual DJIA data. And, visually, we can see that the DJIA has been even closer to the trendline in the last few years since the financial crisis in 2008 than for the previous two time periods. Broadly, the DJIA index traded very close to the trend line in the years 1946-1954, then the index traded above the trend. But from 1965 the index traded largely in a sideways pattern, and so by 1969 it crossed over the rising trendline to trade beneath it. Although the great bull market started in 1982, it wasn’t until 1995 that the index moved definitively back above the trendline. The market fell during the dot-com crash, but despite that the DJIA bounced off the trendline and did not fall below it. The index managed to stay above the trendline until the credit crunch in 2008, when the DJIA crashed down through the trendline. 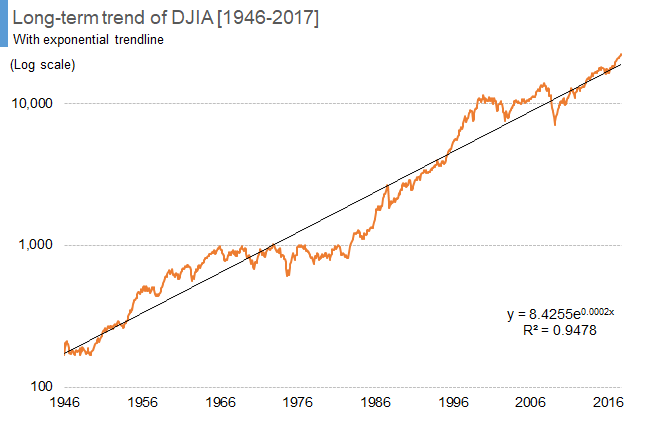 By 2011, the index had recovered to the trendline and then traded close to it for a number of years until the start of 2017 when the DJIA grew strongly and diverged from the trendline. The following table shows the trend values calculated using the equation of the new line of best fit on the DJIA data from 1946. This time the calculated trend value of the DJIA for today (15 December 2017) is 19,396. With the current actual level of the DJIA at 24,651, this means the DJIA is currently trading at a 27% premium to its trend value. Or, alternatively, the DJIA has to fall 21% to equal it’s long-term trend value. And now, with this new trendline, the calculated trend value will be close to the current level of DJIA by December 2020. So, the trendline of DJIA data from 1946 is not doing a bad job at estimating the current actual value of the Index. Finally, let’s look at what happens when we calculate a trendline for the DJIA from 1971 – a somewhat arbitrary date, but chosen as the year that the Bretton Woods system ended and the US dollar became a fiat currency. The following chart is as before, but this time the time range analysed is shorter: 1971-2017. As can be seen, for fairly long periods the DJIA traded close to the calculated trend values. And, for the first time in this analysis, the calculated trendline is currently above the level of the DJIA. Again, and finally, the following table shows the trend values calculated using the equation of the new line of best fit on the DJIA data from 1971. For this final period, the calculated trend value of the DJIA for today (15 December 2017) is 25,733. With the current actual level of the DJIA at 24,651, this means the DJIA is currently trading at a 4% discount to its trend value. The following table summarises the premiums that the DJIA is currently trading at over its calculated trend value, for the four different time periods. For example, as a reminder, at the time of writing the DJIA Index is trading at a 106% premium to its trend value as calculated for data from 1900. So, which trendline do you choose? That, of course, is the big question. 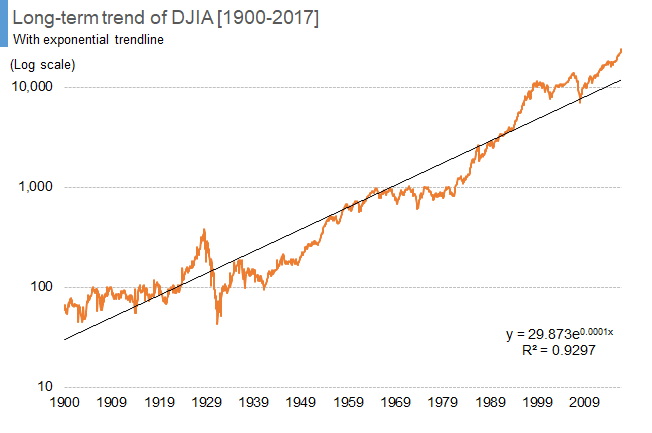 If you think that data from the period 1900 to today is representative of the long-term trend of the DJIA Index and, importantly, that this trend is likely to continue, then this is the trendline to choose, with its indication that the DJIA is currently 106% “over-valued”. As such, you will be concerned that the DJIA is currently at risk of a large fall to move back towards its long-term trend value. 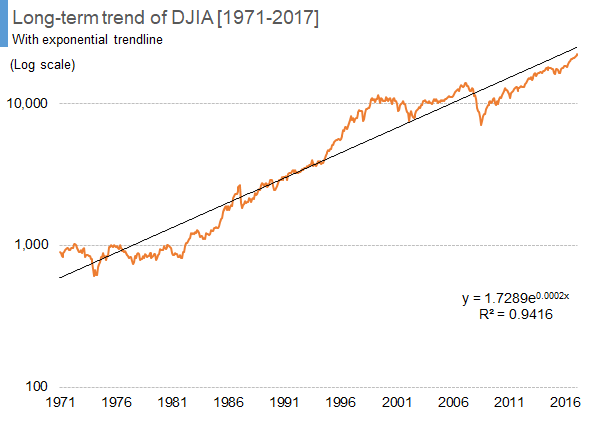 Alternatively, if you think that the time period of 1971 to today is more representative of the long-term trend of the DJIA Index, then you will be happy with the current level of the DJIA as it close to its trend value. This entry was posted in International, Long term, News and tagged DJIA by Almanacist. Bookmark the permalink.